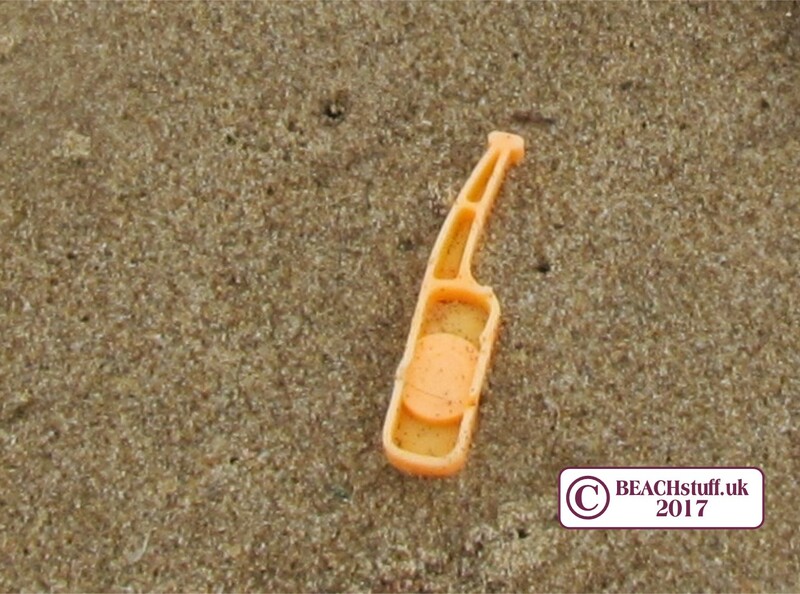 Small plastic items prove the point that throwing or flushing something away doesn't always mean that it has gone. 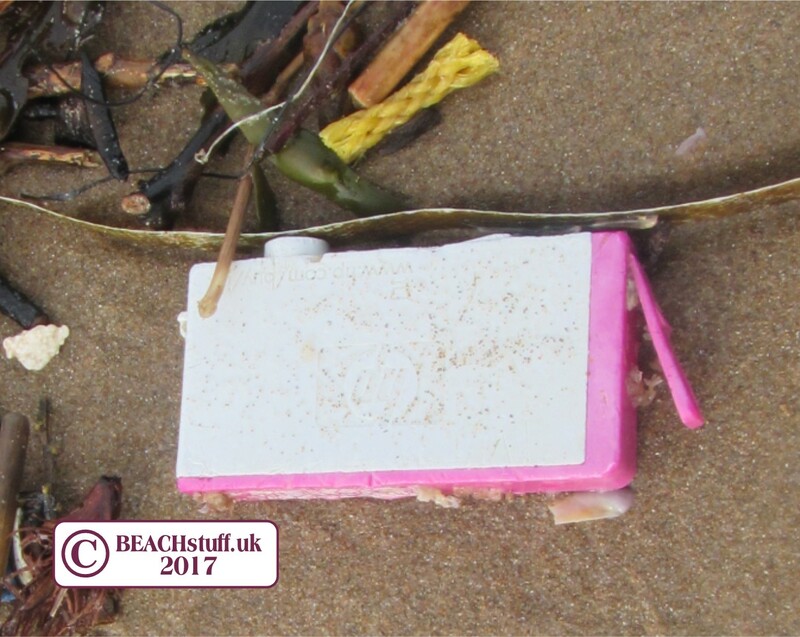 Things that turn up on our beaches have been flushed down the loo, thrown off boats, washed down from fields and roads into our rivers or sewer system, flown in by air (balloons) or simply dropped on our beaches. As plastics will not biodegrade in our lifetimes (or our children's lifetimes), they will hang around in our seas and on our beaches until we physically pick them up and throw them away. There are more plastic items in our Rubbish Gallery. 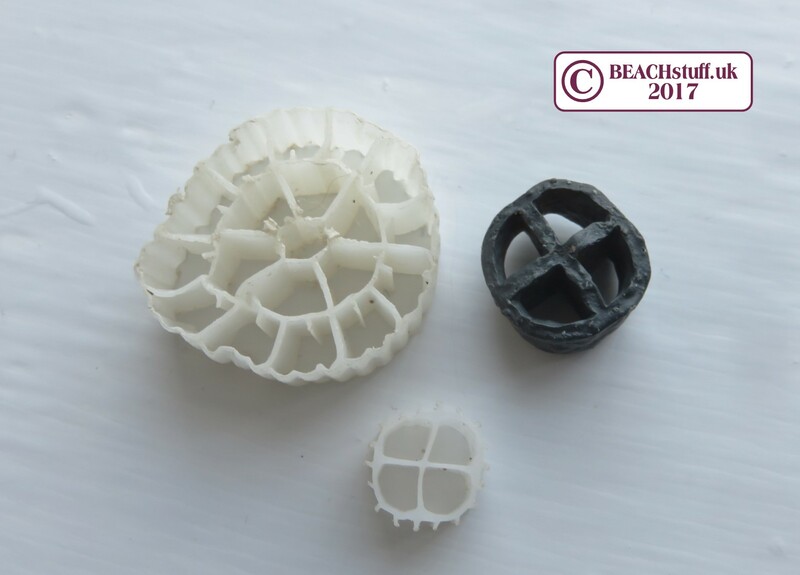 The pieces don't interfere with shipping, or surfing or anything else we want to do. 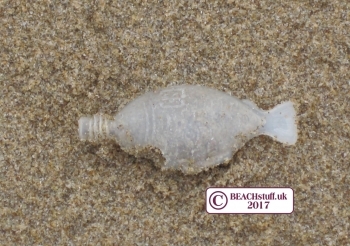 The problem is that sea birds and other marine life mistake pieces of plastic for food and animals like seals, dolphins and turtles get tangled in ropes and carrier bags. The more we can get out of the water, the better for our wildlife. When you pick up litter, tag #2minutebeachclean. 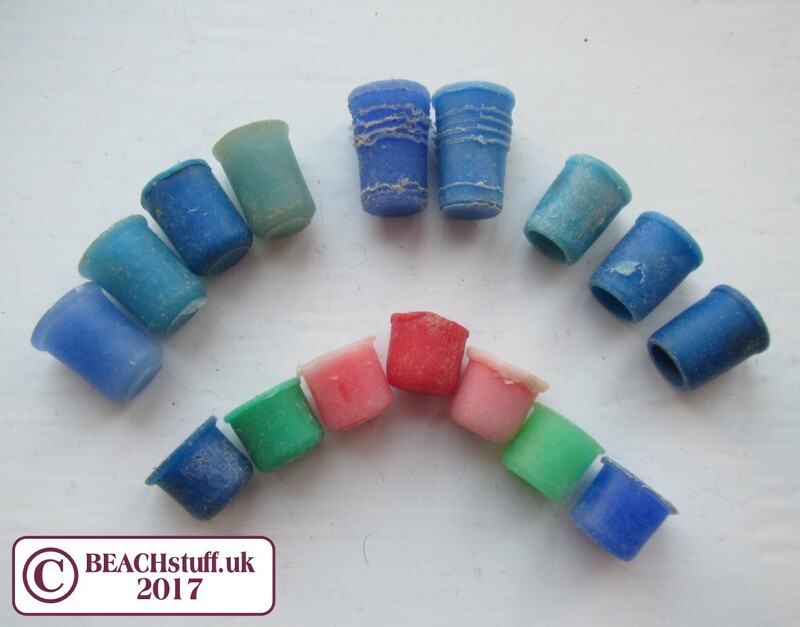 Visit the 2 minute beach clean website for more details. 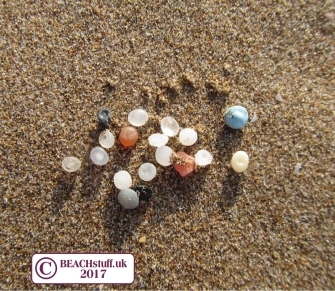 These tiny, largely circular pieces of plastic often litter our strandlines even when there is no sign of larger rubbish. 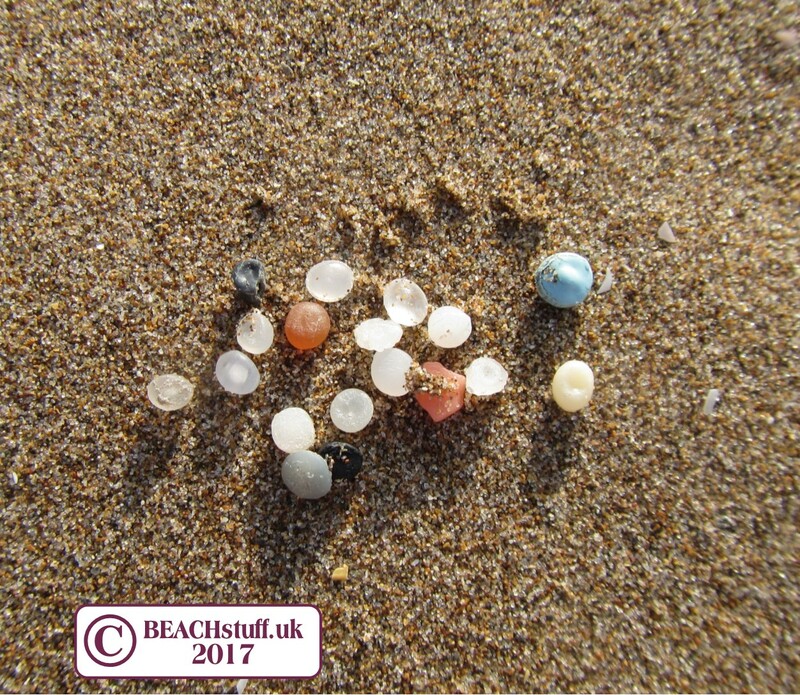 They are only a few millimetres wide and a bi-product of plastic manufacture which somehow find their way into the water. Once there, birds can mistake them for food with dire conseqences. 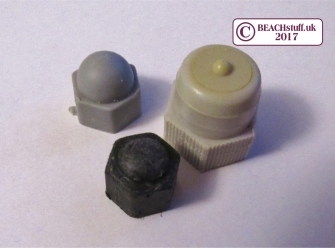 As a slight variation on a theme, these black - less smooth-looking - pieces (photographed below) have been showing up lately. 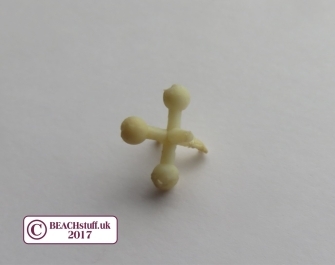 They're still only 3 or 4 mm wide. 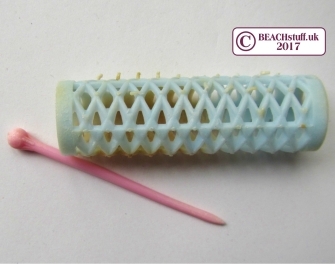 Have a look at 'The Anatomy of the Nurdle' for more information. 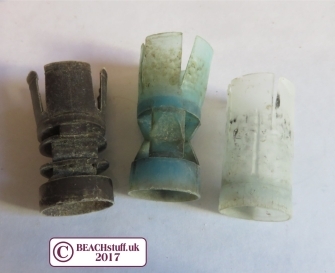 Thousands of sea-themed Lego pieces have been washing up in the South West. 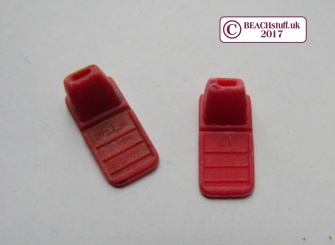 The ones pictured are a snorkelling fin, pirate's cutlass, life jacket, red (marine?) flower, and scuba equipment. Here's what the fantastic facebook page Lego Lost at Sea has to say: "In 1997, nearly five million bits of Lego fell into the sea when a huge wave hit the container ship Tokio Express, washing 62 containers overboard." 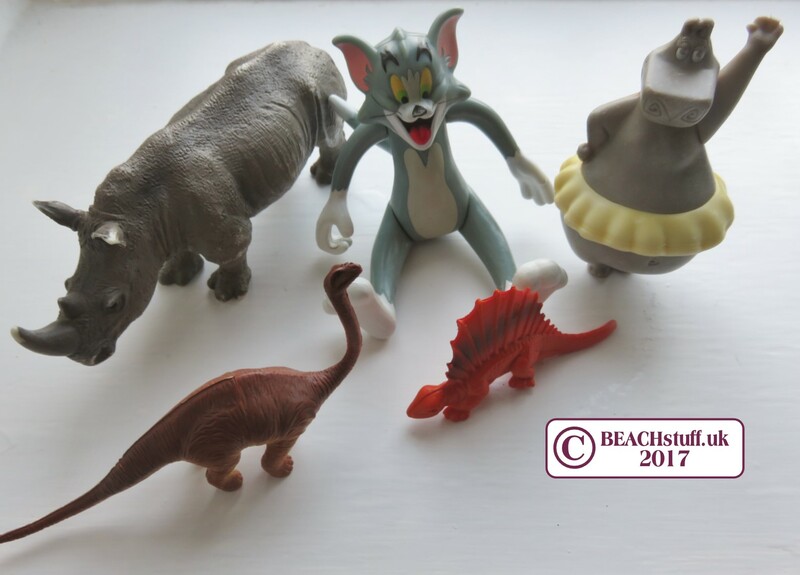 Scroll to the foot of the page for more toys. 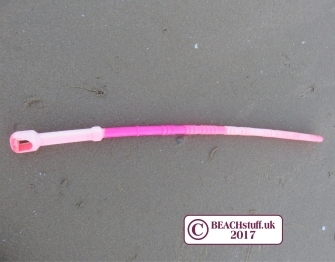 Blue, white pink, these little plastic sticks end up on our beaches in their thousands - usually missing their cotton ends. 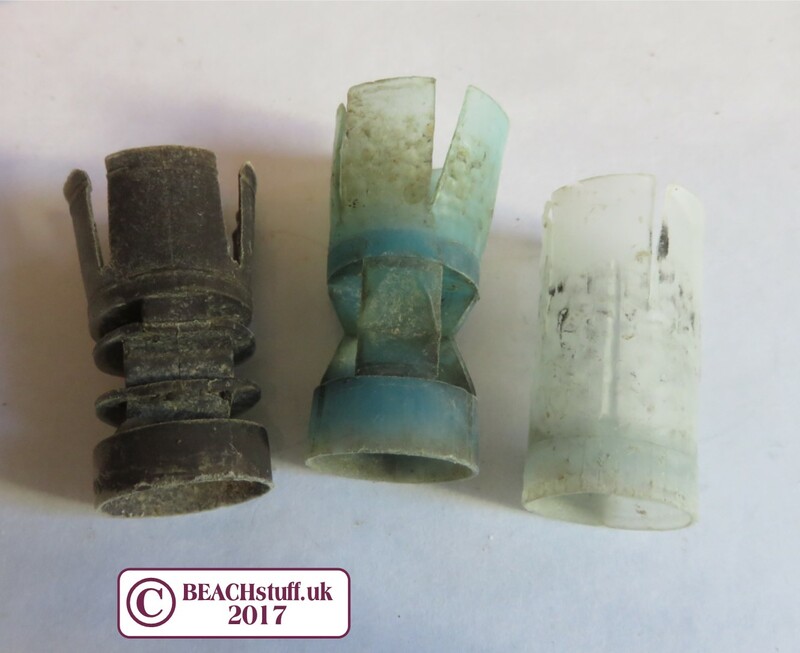 Amazingly, people flush them down their toilets when they've used them and they can then get missed by our water treatment plants and end up back in our water courses and seas. For good news on cotton buds, click here. 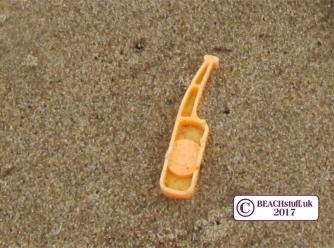 The orange piece is the top 'seal' of a print cartridge. 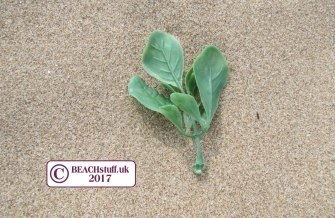 I have found many small pieces of plastic plants on beaches with no idea why. Then the thought struck me that mabe they are from home aquariums. But would people really throw their old aquarium water into the sea? Plants and all? And is Goldie dumped too? I'd love to hear your theories about the plastc plants. Some countries carry out shoots of marine birds, for sport or pest control. The plastic casings of the bullets float in our seas for generations. 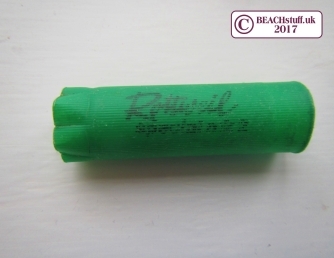 Occasionally, a bullet casing will have branding on it, like the Rottweil bullet below made by a German hunting ammunition company. Others are unidentifiable. 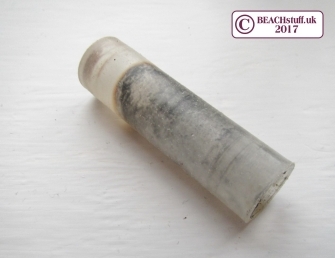 This clear plastic tube is longer and thinner than the bullet casings above. 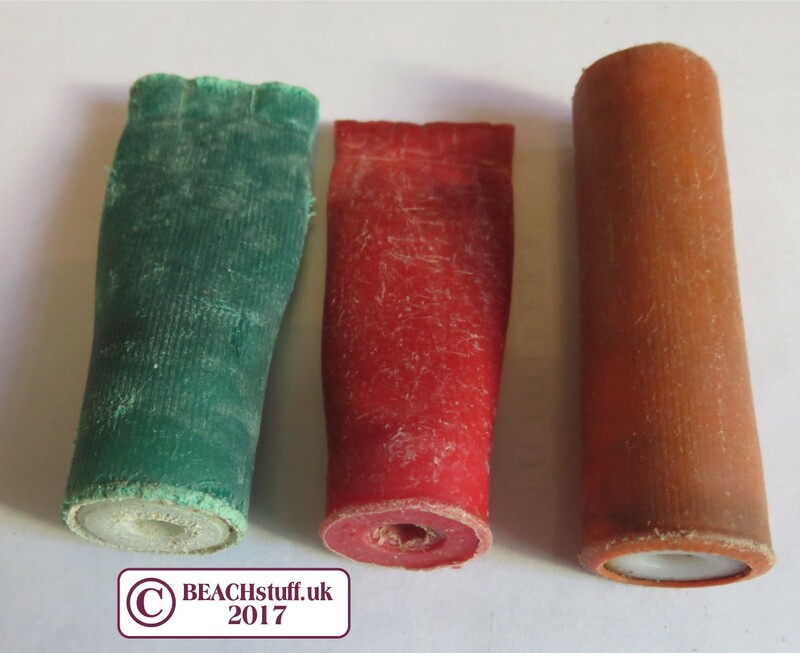 It is in fact the inside of a firework and they are generally blackened by the explosion they have been in. 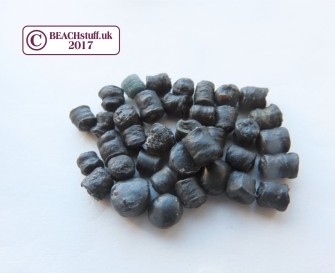 Lots of bits and pieces of fireworks end up on the beach. 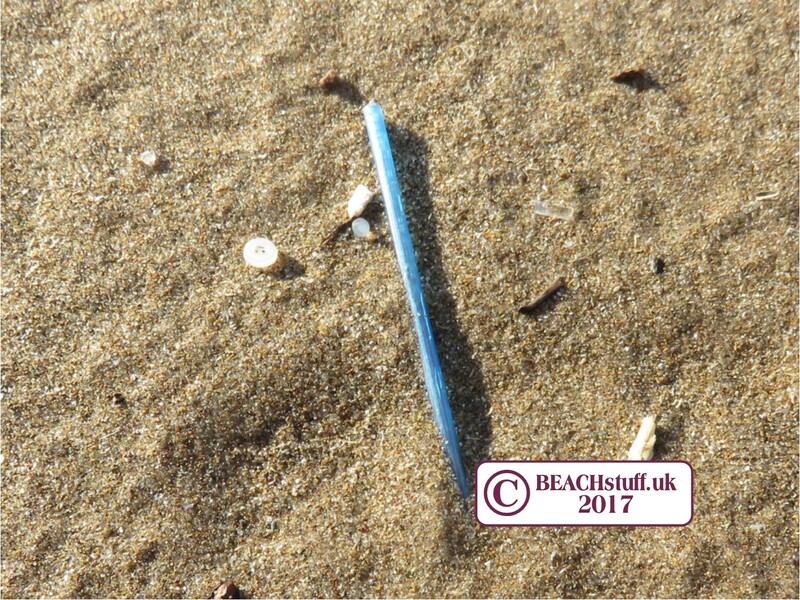 It is perhaps ironic that we end up with plastic fish on our beaches. These are, in fact, nothing to do with the sea, but are plastic soy sauce bottles. This one is missing its cap. Want to see some real fish? Visit this page. There are generally loads of different lids and caps to be found on the strandline. 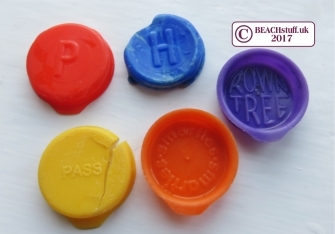 The best, in my huimble opinion, are Smarties lids. Has anyone ever managed to collect a full alphabet? 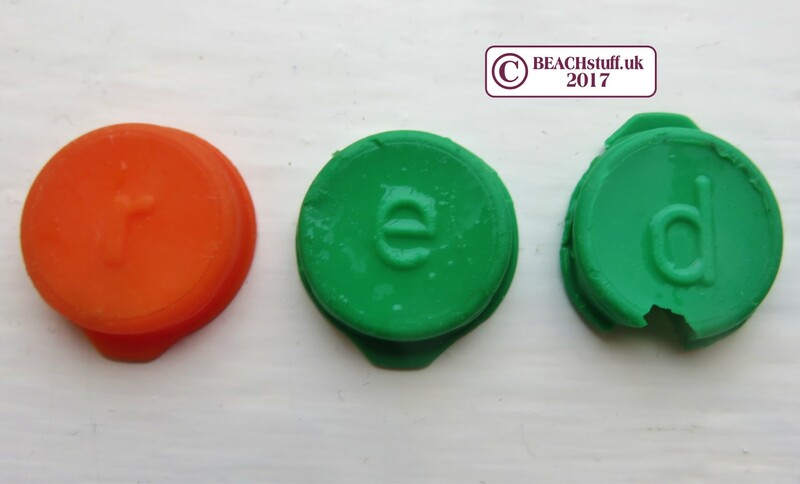 I'm a whopping twenty-one letters off the mark - here's my blog on the Smarties Odyssey. Think that's all there is to Smarties lids? Oh no no no. There are Things to Look Out For. Capital letters on bottom of the lid means that the lid predates the 1970s. After Rowntrees was bought by Nestle in 1988, the tops of the lids were changed to say 'smarties' instead of ROWNTREE. 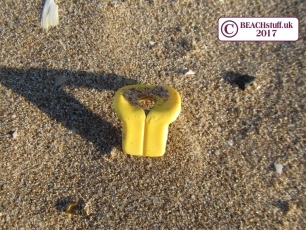 And there are special ones like this yellow one saying 'pass' which was part of a football theme. And there was you thinking they were all just lids! I love this. 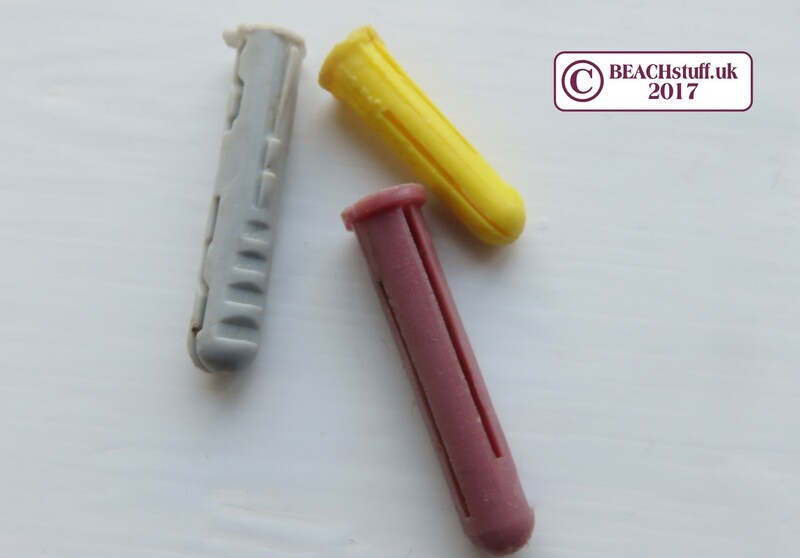 I can remember my grandma putting in her plastic curlers and using picks just like this one to hold each curler in place. I wonder just how long this pick has been floating around. Since the 1960s? 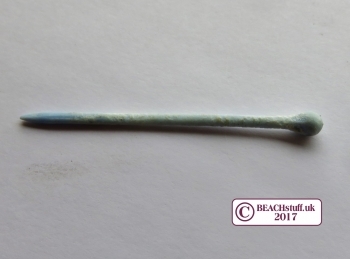 A few months after finding my first pick, in pretty much the same spot, I found a pink pick and then the curler itself (below). These types of plastic ring are thought to be the sort of media used in water treatment plants. I have talked to people in water companies who say that there is no way the media they use in their treatment plants could end up in the sea. Some large ships have water treatment plants on board and perhaps this is the route taken by this sort of thing to get into the sea. 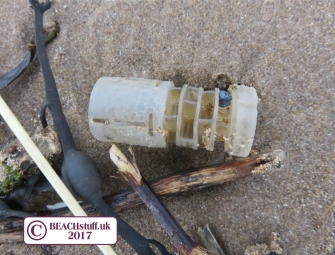 Was there was a spillage of these plastic items at sea? 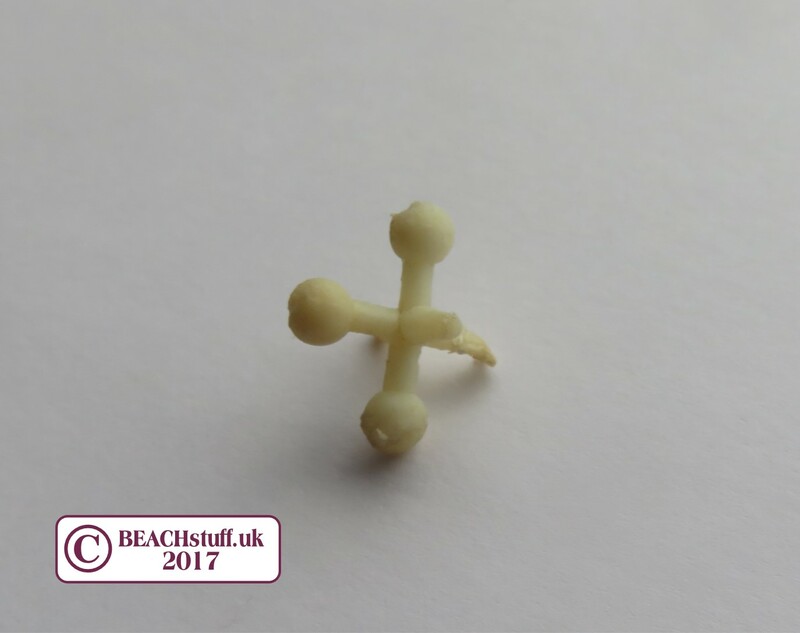 It is not unusal to find these bung-shaped things, some as small as a centimetre high, on the beach. Are they stoppers for test tubes? 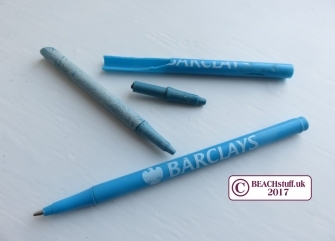 Pens are often found on the strandline but it does seem that more of this type of Barclays pen is around more than other branded pens. 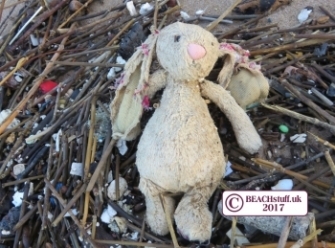 Are there simply more of them to be lost, or was a container of them lost at sea at some point? Or is it just my imagination...? 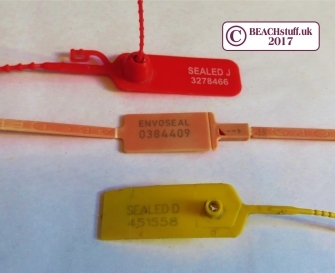 These plastic tags and ties are used to seal anything to prevent it being tampered with. 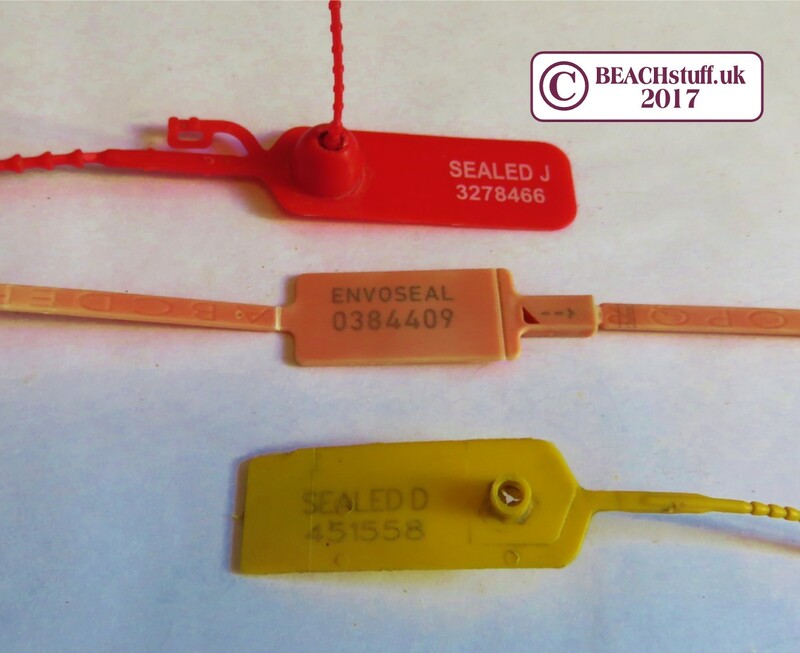 Sometimes, the writing on the tag wil give an indication of its use, otherwise there may only be a number or, perhaps, nothing at all. 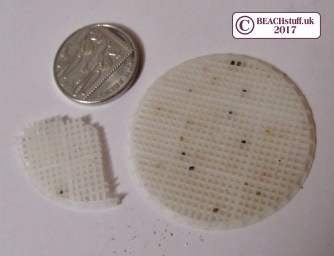 In 2011, a wastewater treatment plant in Hooksett, in Merrimack County, New Hampshire, US, suffered a massive loss of Kreuger Biofilm chips which were used to grow bacteria as part of the sewage treatment process. This one pictured showed up in North Devon in 2017 (10p for scale). Had it been in the water for seven years? Is it from Hooksett? More details can be seen from this news item. 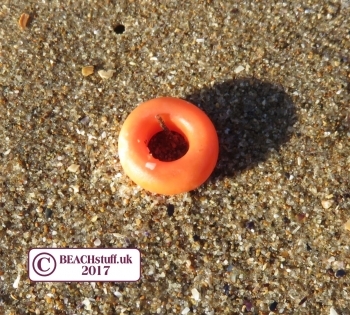 These orange, squishy rings are about the size of Cheerios but, sadly, the comparison ends there. Far from being a lovely breakfast, these rings are used in the process of docking lambs' tails as they help stop the blood flow. 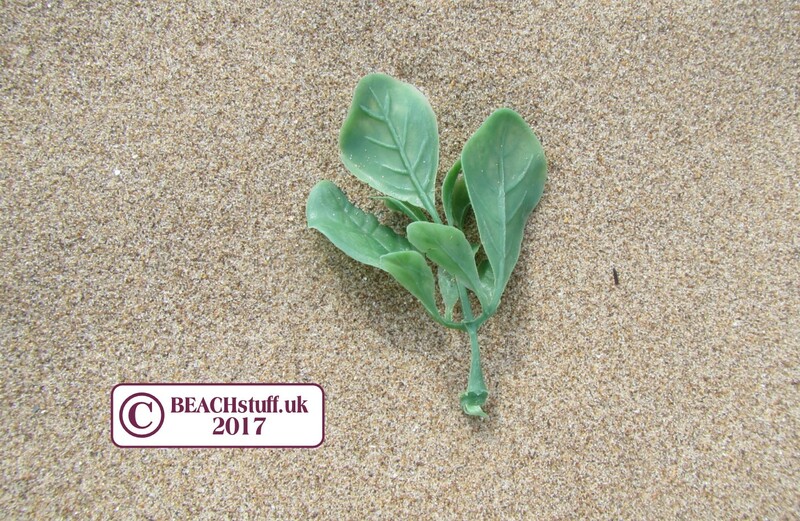 One of the items we find on the beach that we assume comes from farming land in the vicinity. 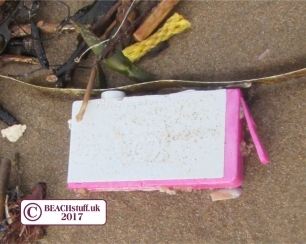 Perhaps items like this are washed into the sea via streams running through the fields. 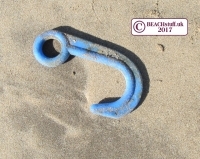 These tough plastic loops used to hold cans together sometimes end up in our seas - with potentially disastrous consquences for wildlife. 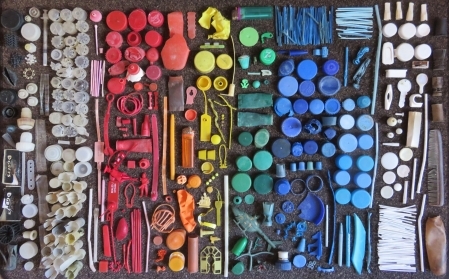 Turtles and sea birds get caught in the loops, other creatures swallow the plastic. And these plastics take lifetimes to biodegrade. Perhaps there is an alternative. 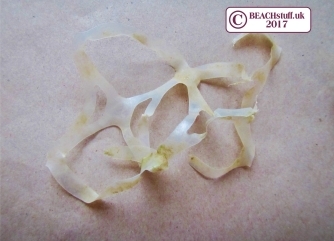 This news feature describes six pack rings which are not only biodegradable but marine life can eat them. 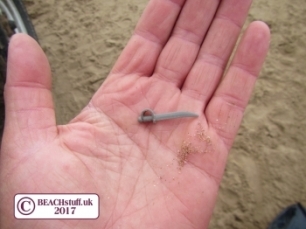 How do bits and pieces of building equipment end up on the beach? I find these plastic covers in a range of sizes and in a range of colours, mostly commonly in around 50 shades of grey. Are they getting washed/blown off roofs and then washed into our storm sewers? Is that how they up on our beaches? Perhaps people should be putting a dab of glue on them to ensure they stay put. 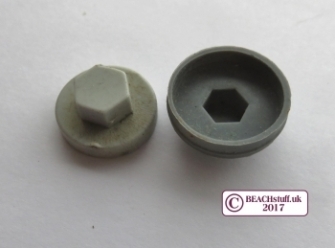 Similar to the roofing screw covers above, these are designed to protect metal nuts and bolts. 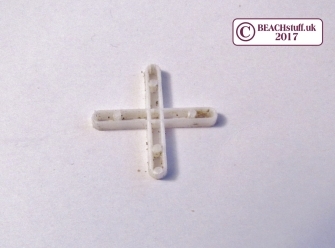 Tile spacers turn up on the beach with some regularity. But how do they get from our walls to the beaches? 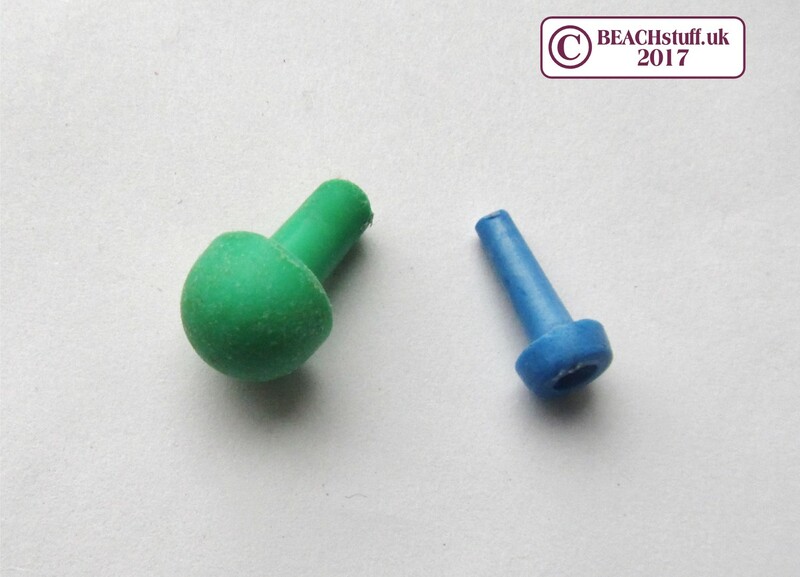 These little plugs, used for holding screws in the wall, are perfect for floating on the ocean. Lightweight but sturdy plastic, they will be with us for generations. However, if you do happen to pick them up, they are very handy to have in your toolbox - most still being usable. 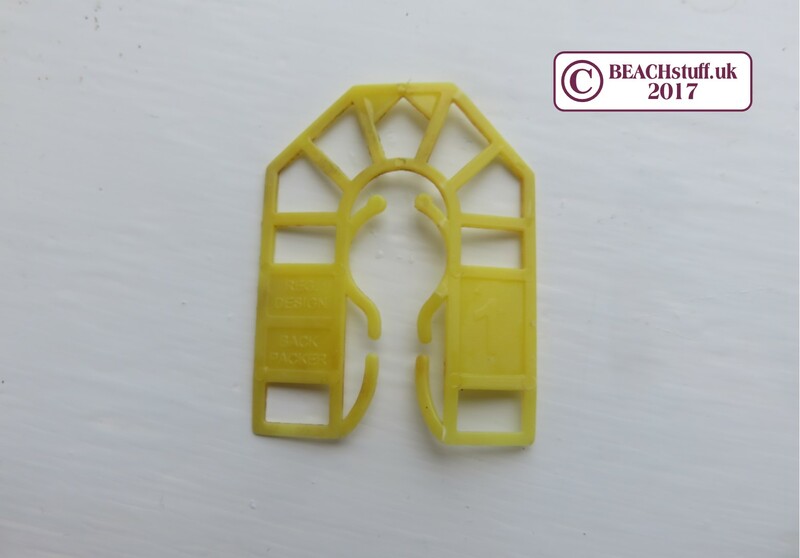 Known as shims or horseshoe packers, these are used in those jobs where spacing is important (like fitting a door or window). Each is numbered to depict the sizing it will give you. 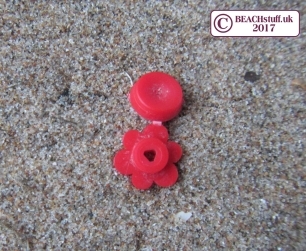 Many of the items (like those pictured below) washed up from fishing activities are also made of plastic. I've got a whole page of the stuff here. I used to spend hours playing this as a kid. 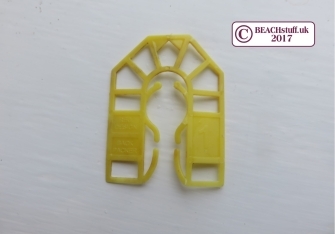 These pieces of plastic take me right back to those frustrating days of trying to guess precisely what colour combination was behind the little screen. Grrr. Here's a game that has been played for donkeys' years. No wonder it's worn out. 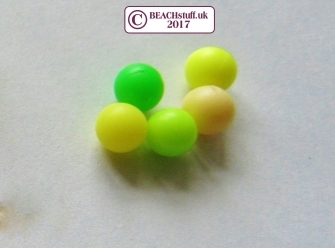 These tiny flourescent balls come with toy plastic guns. 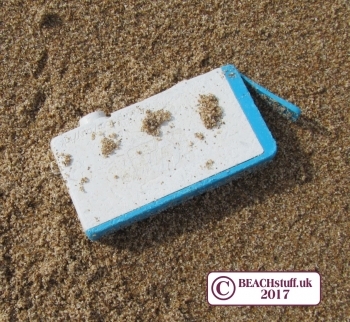 Once they have been shot onto the sand, they are lost forever - until some beachcomber comes along and picks them up. 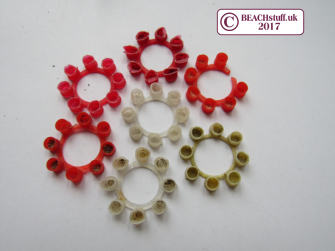 Compare these with the flourescent beads used in fishing. 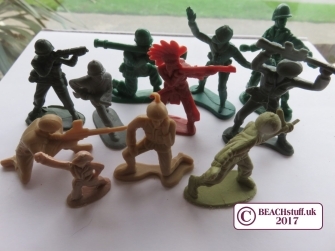 I am not sure that I have ever witnessed anyone ever playing with toy soldiers on the beach. Ever. And yet I find them regularly. 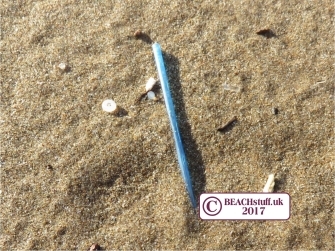 This plastic item was about three quarters of a metre long and two-three centimetres in diameter at its widest point. Very sturdy and strong. Any ideas? Email and I'll feature them with your name and any photos. As soon as we've solved this one, I'll post another. 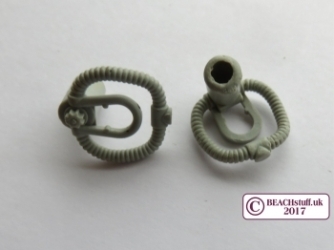 And what about these? 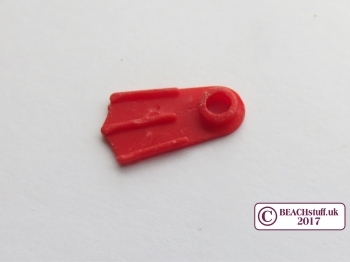 About a centimetre long, always in red it seems. Are they the feet of square penguins? Or on buttons that will never be pressed? Any ideas to the usual email address.